After reading Act I, students understand the feud between the Montagues and the Capulets and also have a grasp of the characters. Act I, Scene V and Act II, Scene II are all about love, which is why I pair the two scenes together. Here's my approach to teaching them. I don't want to kill the play, so in each act, I generally choose to read the scene with the events most important to developing the plot. Act I, Scene V and Act II, Scene II are equally important and so strongly connected, so we read them both. Before jumping into this week's reading, we'll spend a few minutes reviewing the scenes from last week. I'll also introduce or review important terms. Act I, Scene V and Act II, Scene II are full of figurative language so I'll review simile, metaphor, and personification. It is also important for students to understand two drama terms: aside and soliloquy, so that they understand who characters are speaking to in these scenes (other characters versus the audience). I have students read this scene independently, since we later watch two different film versions of the scene for comparison. The focus is on Act I, Scene V, so I provide summaries of the start of the scene; Act II, Chorus; and Act II, Scene I. The text of Act I, Scene V has the original text with the modern translations side by side. Like the previously read scenes, I also edit it down (cut out lines). After reading, students translate words from the original to modern text, and vice versa. They also answer short written response questions to demonstrate comprehension. We review this together at the end of class. I like to show a scene or two at the beginning of reading the play to help students visualize the setting and characters. It can also help with student buy-in. Watching two or more versions of the same scene allows students to compare and contrast the decisions made by directors. With Romeo and Juliet, I like to show Act I, Scene V because so many of the characters are present and it includes two major plot developments (Romeo and Juliet meet, and Tybalt vows revenge for Romeo's trespasses). I find the Zeffirelli and Baz Luhrmann film versions are the most accessible. In Zeffirelli’s interpretation, show Clip 1, Scenes 5–6 (0:22:49–0:38:47). Begin as guests are being welcomed to the party and end after Juliet realizes who Romeo is. In Luhrmann’s interpretation, show Clip 2, Scenes 8–12 (0:25:30–0: 33:12). Begin after Romeo submerges his face in the water and end after the Nurse tells Juliet who Romeo is. As the students watch, have them focus on the effect of the costumes, music, lyrics, lighting, etc. on this first meeting of Romeo and Juliet. Students can record their thoughts in a graphic organizer and then write an opinion response on which film version is more effective. Once students are comfortable with the language, I ask them to play the part of the director and insert stage directions. Where do characters enter and exit? When does Romeo reveal himself to Juliet? After students read Act I, Scene V, but before they compare film versions, I have them create masks for the masquerade. Templates for masks can be found online such as these. I ask students to create Romeo & Juliet themed masks or to create a mask that represents one of the characters as a way to practice use of symbolism. Before hanging the masks up, I lay them out with numbers so that students can vote on the best masks. Students then enjoy seeing how characters are dressed, especially in the Baz Luhrmann version, and comparing the director's choices to their own. To reinforce figurative language, I pull lines from both Act II, Scene V and Act II, Scene II for students to analyze. I have students identify the types of figurative language used and explain their meaning. If students struggle, having them look back at who said the line to whom and in what context often helps. Then students write a love notes using expressions from Shakespeare’s time, many of which incorporate figurative language. I give students the option of writing from Rosaline's perspective, telling Romeo that she no longer wants to live a life of chastity and asking him to take her back, or from Count Paris's perspective, describing to Juliet how wonderful it was to meet her at the party and how excited he is to get married to her. Once students have warmed up their romantic writing skills, we revisit the balcony scene. 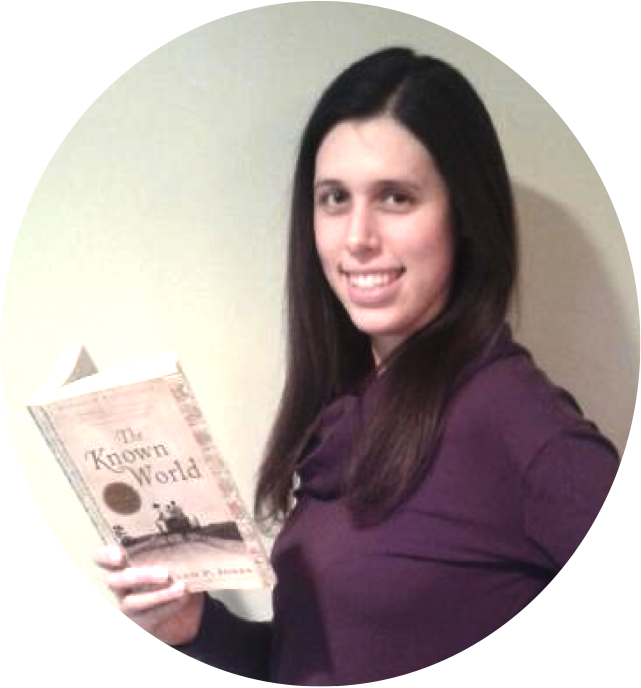 I provide students with the original text and a modern version, and students must translate the scene into a teen's conversation via text. Depending on the group of students, this activity could be done with cell phones, but I have also done it with small white boards and I acted as a runner for the messages. Be sure to assign roles for either option. There should be a texter (sending messages) and a recorder (recording both out going and incoming messages) in each group. If you choose to use cell phones, designate one cell phone per group to be used, make sure the students have each other’s numbers, and do a test text. Smaller groups work better (three to four students) and you can separate boys and girls or have mixed groups (sometimes the boys can be a bit shy with this activity). I also assign a text based assessment, which covers Act I, Scene V through Act II, Scene II. The assessment includes a section of Act I, Scene V and a section of Act II, Scene II, ten multiple-choice questions, and two choices for a written response. Questions ask students to analyze characters words and actions, analyze figurative language, and apply drama terminology. 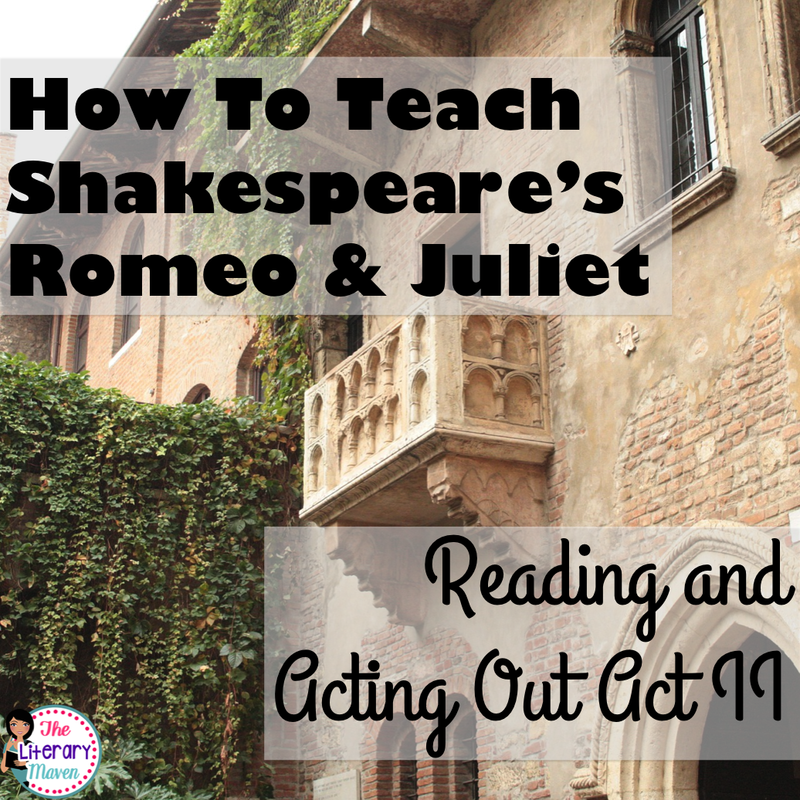 You can find all of my resources for teaching Romeo and Juliet, including the materials described above that I use to teach Act II, here. 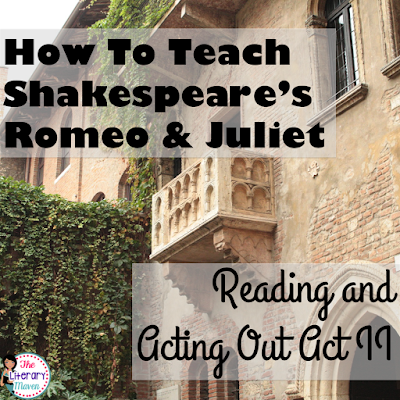 Read on for my approach to teaching Act III of Romeo and Juliet.